Beyoncé posted some pictures on instagram wearing a Plaid Fitted Blazer ($1,895.00) and matching Plaid Flared Trousers ($995.00) by Prabal Gurung, a Chanel Crystal CC Sunglasses Brooch ($550.00), Diane Von Furstenberg Bonne Soirée Bag (Sold Out), Saint Laurent Round Sunglasses (Sold Out) and Alexander Wang Fishnet Booties ($995.00 – wrong color). Lana Condor appeared on Teen Vogue wearing a Diane von Furstenberg Turtleneck Crop Sweater ($93.00), J Brand Selena Mid-Rise Bootcut Jeans ($218.00), Atelier Swarovski Moselle Drop Pierced Earrings ($199.00) and Sergio Rossi Godiva Pumps ($495.85). Lea Michele attended Jennifer Klein’s star studded Day of Indulgence Party in Brentwood wearing a Diane von Furstenberg Long Sleeve Crew Neck Floor Length Dress ($358.80 – wrong color), a Celine Grained Calfskin Small Trotteur Bag (Sold Out), Quay Mod Star Sunglasses ($60.00) and Barneys Crisscross Ankle-Strap Sandals ($295.00). 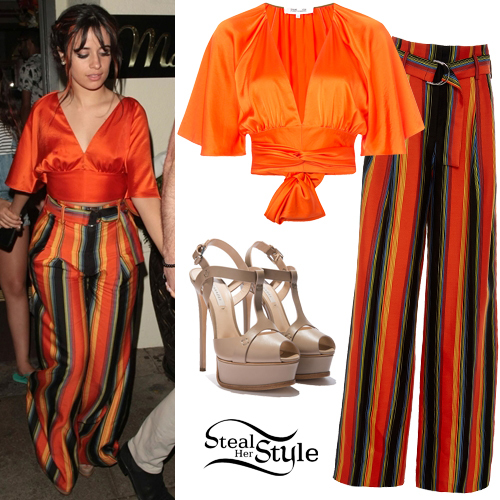 Camila Cabello was spotted leaving Madeo restaurant in Beverly Hills wearing a Plunge Cropped Blouse ($179.00) and Wide-Leg Striped Belted Pants ($358.80) both by DVF Diane von Furstenberg, and Casadei Platform Sandals ($870.00). You can find similar pants for less at Boohoo ($20.00), River Island ($60.00) and Topshop ($68.00). Maddie Ziegler attended The Radio Disney Music Awards in Los Angeles wearing a Diane Von Furstenberg Short Sleeve Ruffle Wrap Dress ($248.00), a Simon Miller Bonsai Bucket Bag ($390.00), Alison Lou Medium Jelly Hoops ($145.00), a Cartier Love Yellow Gold Ring ($1,650.00), her Jordan Askill Ruby Enamel Heart Ring ($255.00) and Stuart Weitzman SquareNudist Sandals ($199.00). Maddie Ziegler was spotted doing some shopping at The Grove in Hollywood wearing a Diane Von Furstenberg Belted Stretch-Denim Mini Dress ($510.00), a leather jacket similar to this one from Bershka ($39.99) and Sam Edelman Yaro Striped Sandals ($71.90 – wrong print). Storm Reid arrived at the Lupus LA’s Orange Ball: A Modern Supper Club! wearing a Diane von Furstenberg Olivia Dress ($448.00) and Katy Perry Collections The Alexxia Sandals ($109.00). Lucy Hale attended Beautycon Festival in New York today wearing a Diane von Furstenberg Zip-Front Belted Dress ($392.00), a Pave Diamond Doorstop Ring ($620.00), Gold & Pavé Diamond Eternity Ring ($1,170.00), Yellow-Gold & Diamond Large Bezel Evil Eye Eternity Ring with Blue Sapphire ($3,150.00) all by Sydney Evans, and Stella Luna Turnlock Suede Sandals ($390.00 – similar style). Emma Roberts attended the annual MET Gala at Metropolitan Museum of Art in New York last night wearing a custom Diane von Furstenberg Gown (Not available online), Diamond Cluster Studs and Atelier Rose-Cut White Diamond Bracelet both by Monique Péan (Not available online), a Diane Von Furstenberg Soiree Velvet Shoulder Bag ($250.00) and Prada Bicolor Velvet Crisscross Platform Sandals ($825.00). Sofia Carson stopped by the set of Univision’s Primer Impacto today wearing an iridescent pantsuit from Diane Von Furstenburg, Giuseppe Zanotti ‘Betty’ Metallic Leather Platform Sandals ($795.00) in silver with gold heels, and Dior EverDior Pink Crystal Earrings (not available online) – similar style (£340.00). Get the look for less with a blazer from Missguided ($59.50), trousers from Vince Camuto ($44.44), metallic sandals from Jessica Simpson ($71.37), and earrings from Cristabelle ($12.97).